This sauce is boss. We start with fresh organic carrots, onion, garlic, habaneros and fire roast it all to perfection. Then we blend with vinegar and balance the flavours with a touch of sea salt and raw sugar. At first taste, you will detect the delicate sweetness of roasted carrot followed by the crisp heat of habaneros. All the while, the perfect ratio of roasted onion and garlic gives it that umami everyone is searching for. At medium hot, this habanero sauce delivers on heat without compromising flavour. It is on tap at our house! Suggestions for use: Try this sauce in combo with any salty Asian dish, or meat off the grill – especially good with beef. Marinade with yogurt, mix it into mayo for spicy aioli or right on fresh veggies as a super healthy hot sauce delivery! It’s the perfect way to spice up your chilis, soups and stews – it can be added during cooking or afterwards to individual taste. Of course, it's delicious on foods traditional to hot sauce pairing – pizza, eggs, sandwiches and burgers – but more exotic pairings include – sushi, Ceasars or even on your salad! Savoury perfection! This sauce has something for everyone. A mouthwatering tang that only fresh squeezed lime juice can evoke, the perfect amount of roasted garlic and just enough warmth from the jalapeños will elevate any food. We start with fresh jalapeños, onion, garlic and fire roast. Then we blend with just the right balance of vinegar, fresh squeezed lime juice, sea salt and raw sugar to produce a beautifully charred green sauce that delivers the perfect medium heat. Truly a universal sauce, we find ourselves putting this on everything! Suggestions for use: Go-to for eggs and pizza, but it seriously goes on anything. It is a great addition to any fresh salsa or guacamole and will spread out the heat evenly. Mixed with olive oil or yogurt, this makes a great marinade for chicken or fish. The flavour is more traditional to Mexican style foods so it pairs very nicely with them. But go ahead and put this on anything and everything you’re eating! Fruit-based hot sauce done right. We start with fresh habaneros and garlic and fire roast. Then we add heaps of fresh pineapple and just the right amount of vinegar and sea salt before blending into a sauce that delivers the perfect sweet heat. 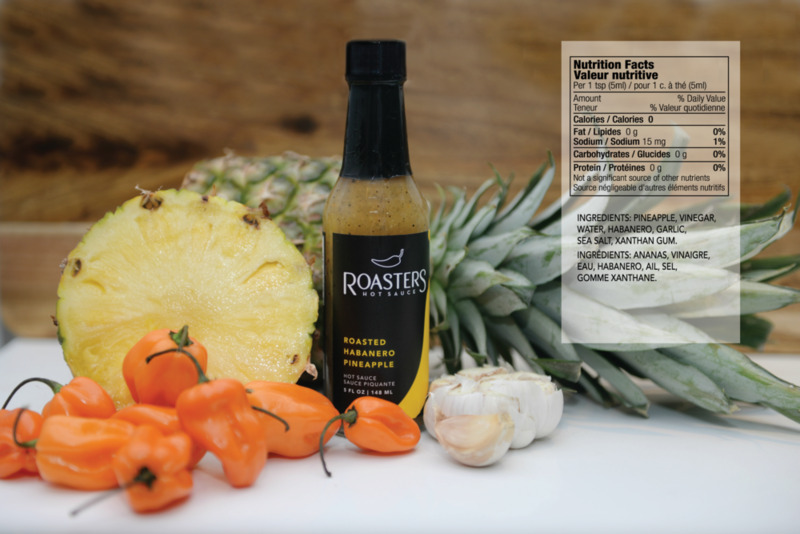 We use a lot of pineapple with this sauce, so the first flavour to hit your palate is juicy sweet pineapple, followed quickly by the habanero heat you love. At medium hot, sweet balanced heat is what you get with this sauce. Suggestions for use: Pairs beautifully with fish tacos and seafood in general. A delicious fiery addition to any sandwich, but try adding to chicken, tuna or potato salad for an elevated spice. Equally good with traditional hot sauce pairings (eggs, pizza, burgers) but with the sweetness of pineapple, other interesting ideas include salad dressing, with Indian food or try adding to your favourite baking recipe for a spicy kick!